Bengaluru- 5 August, 2012: Javed Akhtar and Shankar Mahadevan, the duo that has established a firm presence in the minds of discerning music lovers, has yet again woven a magical track that echoes The Akshaya Patra Foundation’s mission loud and clear. The song conveys a powerful message on the importance and significance of education and the need for values. A mellifluous melody with powerful lyrics sung flawlessly by Shankar makes the track truly special. The chorus by children adds to the beauty of the song. A video, shot in the locales of Rajasthan, where Akshaya Patra has a large presence, by upcoming Director Abey Abraham, complements the song. The track will be released by Narayan Murthy, Chairman Emeritus, Infosys Limited, and Sudha Murty, Chairperson of the Infosys Foundation who have been long time patrons of Akshaya Patra. The launch is scheduled for August 5, 2012 in Bangalore. Akshaya Patra which owns the copyright of the song is expected to market the song in a big way after its release with an intention to raise awareness about its programme to enable hunger free education. The entry for the billionth meal celebration is by invitation only and is limited to individuals and government functionaries and key donors who have been partners to the success of the mid day meal programme. About The Akshaya Patra Foundation: The Akshaya Patra Foundation is a not-for-profit organisation headquartered in Bengaluru, India. 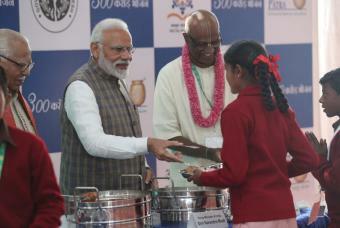 The organisation strives to fight issues like hunger and malnutrition by implementing the Mid-Day Meal Scheme in the Government schools and Government aided schools.Since 2000, the organisation was striving hard to reach out to more and more children with wholesome food on every single school day. Akshaya Patra is continuously leveraging technology to cater to millions of children. Its state-of-the-art kitchens have become a subject of study and they attracts curious visitors from around the world.In partnership with the Government of India and various State Governments, and inestimable support from many businesses, philanthropic donors and well-wishers; the organisation have grownto be the world’s largest mid-day meal programme serving wholesome food to over 1.4 million children from 10,845 schools across 10 states in India.The organisations vission is that no child in India shall be deprived of education because of hunger.